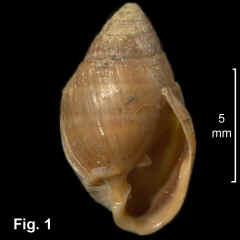 Description: Shell usually very eroded, with early whorls missing. Spire straight-sided or weakly convex, whorls weakly rounded. Whorls smooth apart from 1 weak spiral groove below suture. Aperture more than 50% of total shell length; inner lip of aperture with 2 sharp folds, sometimes a spiral cord originating at upper fold. Umbilicus covered by columellar callus. Outer lip thickened internally in mature shells, the thickening sometimes developing into a longitudinal tooth. Colour greenish brown or dark brown with fawn spiral bands. Distribution: Endemic to Australia: Port Curtis (near Gladstone), Qld, southwards to Lakes Entrance, Vic, and north-western Tas. Habitat: Lives on mud, logs and other solid objects among mangroves and in salt marshes in the upper littoral. Common to abundant. This species is more tolerant of low salinity than O. ornatus or O. sulcatus, and is found at higher levels on the shore. Comparison: This species is shorter and wider than Ophicardelus ornatus. Non-eroded specimens show 1 spiral grove below the suture, but it is weak and normally obscured by erosion or growth lines. A better distinguishing feature is the thickening inside the outer lip, often developed into a longitudinal tooth in mature shells. Synonymy: This species was originally described as Ophicardelus quoyi H. & A. Adams, 1854 and was known by that name until 2005, when it was transferred by Hyman et al. to the genus Pleuroloba. Remarks: Jansen (1995) described and figured this species as having 3 folds on the inner lip with the middle one strongest and pointed downwards, but I can find no specimens that match her description and figure in the Australian Museum collection. Fig. 1: South West Arm, Port Hacking, NSW (C.85157).